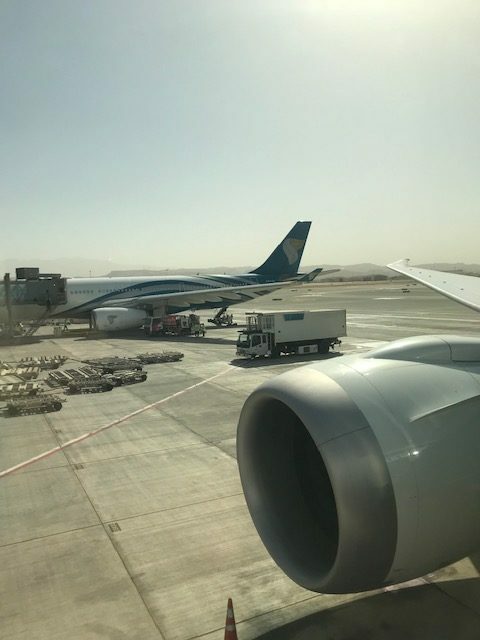 Oman Air, the national carrier of the Sultanate of Oman, has recently upgraded its service from Manchester to Muscat with the introduction of a brand-new Dreamliner. Flight WY106 from Manchester to Muscat departs in the evening at around 8 pm. 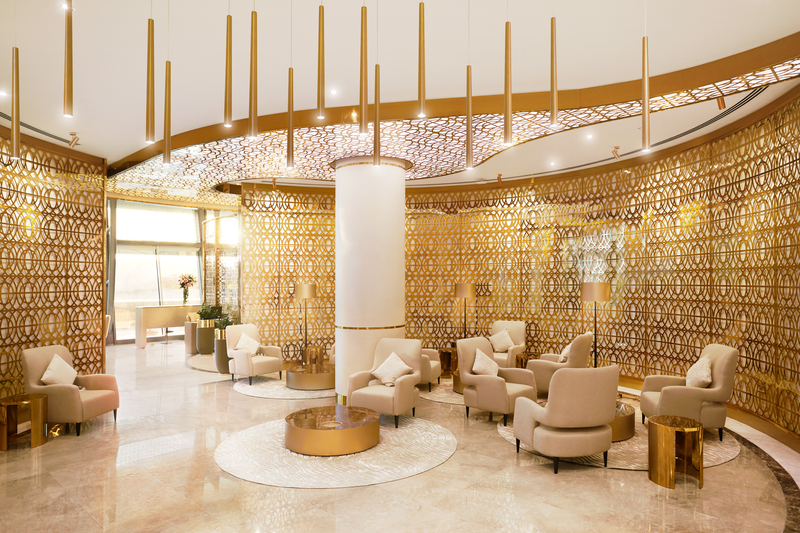 We had already checked-in online and we were swiftly escorted through security by airline staff after picking up our lounge passes from the business class check-in desk at terminal 2. We were welcomed with smiles. There was no one else queuing to check-in, which is rare when travelling out of any airport and the staff could not have been more helpful. 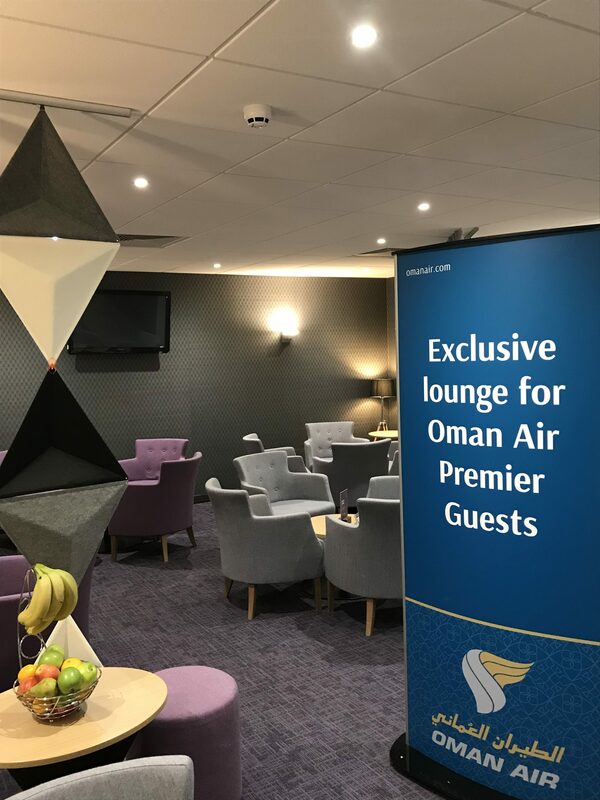 Oman Air doesn’t have its own lounge at Manchester airport, however, it does have its own premium area all decked out in the airline’s colours within the Aspire lounge where other passengers can pay to access. This isn’t an issue, however, as given it was a night time flight there was hardly anyone using the lounge or within the airport itself it seemed. 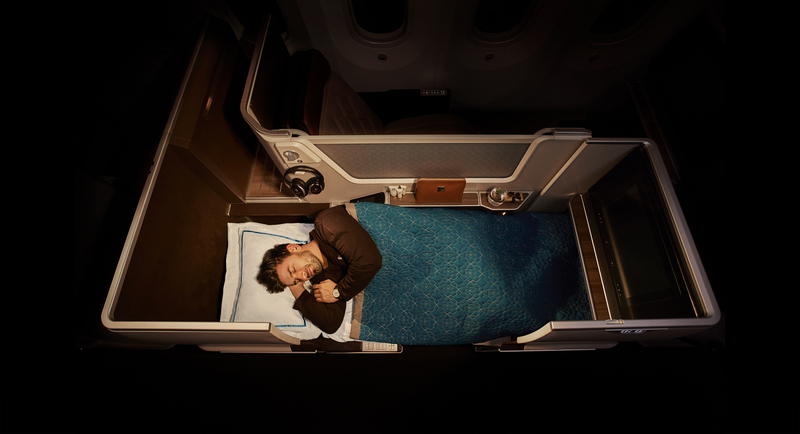 Oman Air has two 787-9 Dreamliners that are kitted out with the Apex suites in a 2 x 2 x 2 configuration. 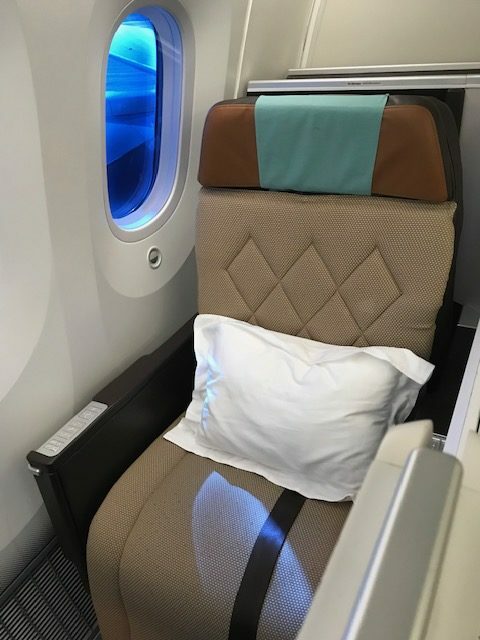 Version 1 and Version 2 of the Dreamliners have similar configurations although Version 2 has an additional cabin situated behind the main business class cabin with six more business class seats. The innovative layout is comparable to many first-class cabins. Every seat offers direct aisle access even those next to the windows. 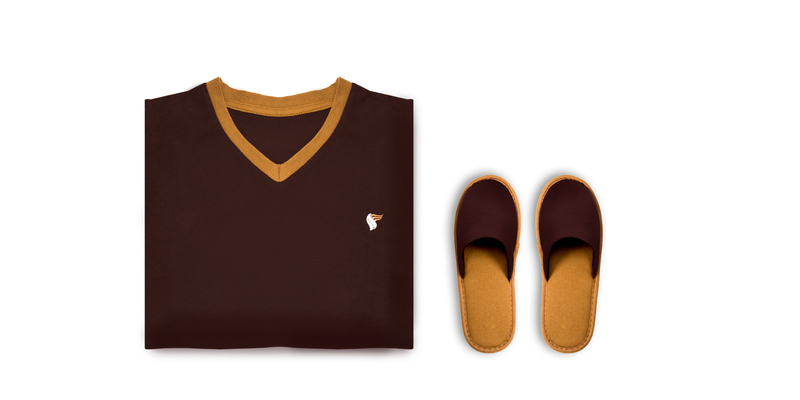 There’s use of evocative Omani colours as the cabin finishes are dark brown and sand emulating that of Oman’s spectacular landscape and warm hospitality. Immediately, you can tell that this plane is brand spanking new! 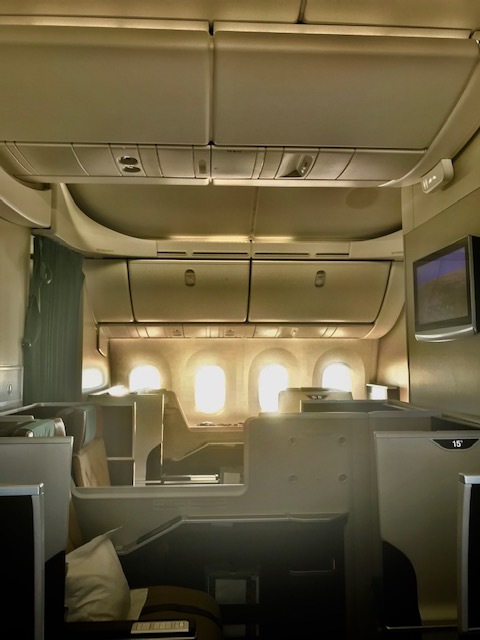 While the middle and aisle seats are great, the window seats offer more privacy given the partitions between the layout of the seat configuration that essentially creates your very own private suite in the sky. 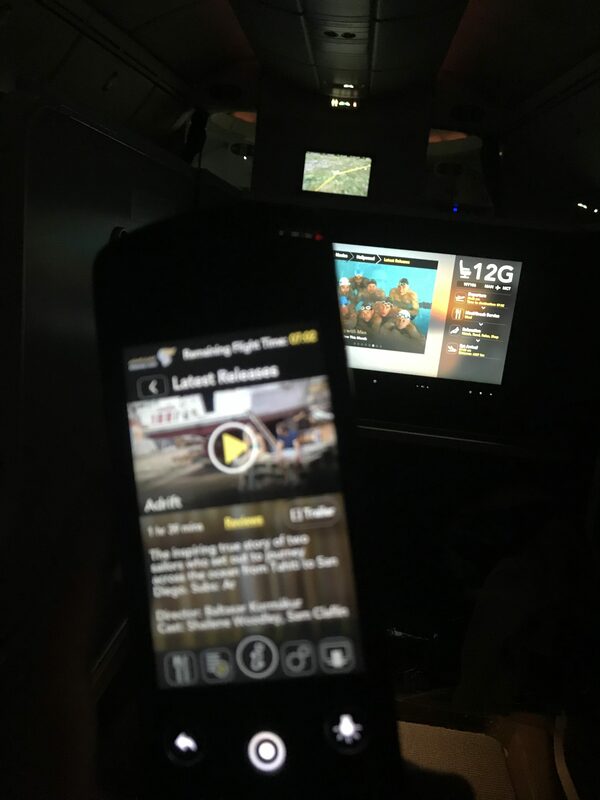 On our outbound flight, we were seated in the middle of the cabin: 14D and 14G. On our return flight, we were seated in 14J and 14K. 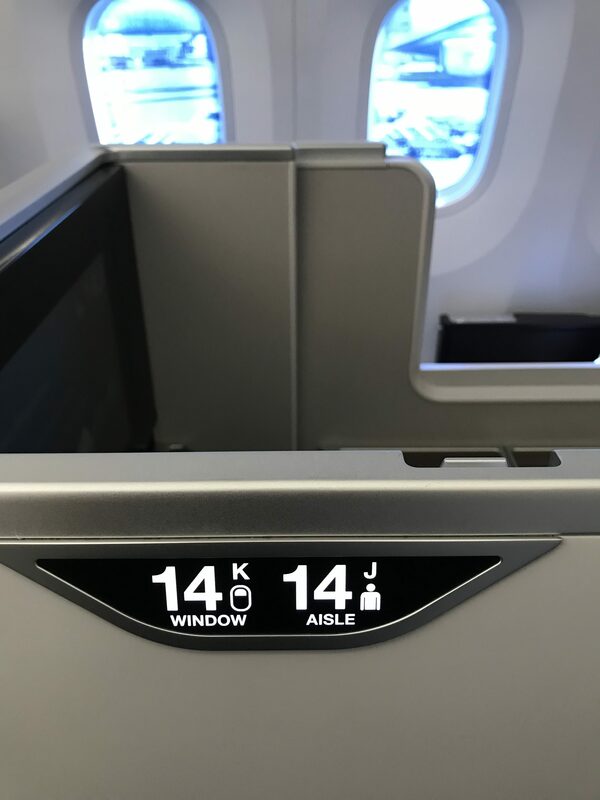 My advice would be to try to book either 14A or 14K as these seats have EVEN MORE privacy given that these are situated at the back of the business class cabin and there will be no one else sitting behind you. 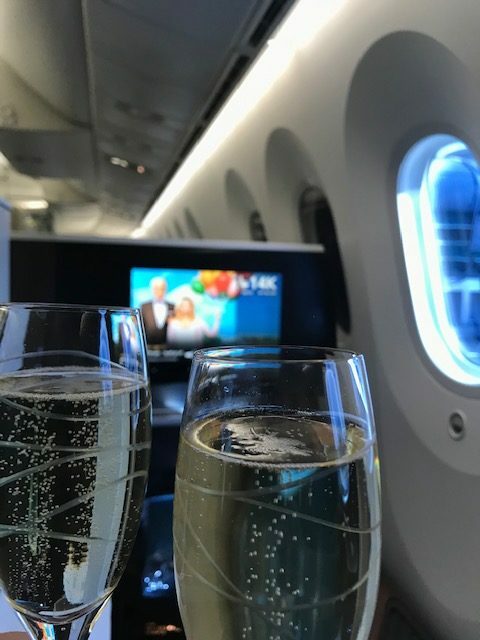 That said, any seat within this luxurious business class cabin has its advantages! Obviously, there’s plenty of storage in the overhead stowage bins and in the suites as you would expect, however, the best space to store stuff is underneath the foot rest where you can fit an entire carry-on bag. There’s more storage to left of the seat where water bottles are kept along with the noise cancelling headphones. This is an ideal place to keep your passport, amenities literature and devices throughout the flight. On the left arm rest there’s a touchscreen remote along with USB and power points to charge your devices. On the right arm rest of the seat there are more controls to make the seat convert into a fully flat-bed for sleeping as well as massage functions to help you to relax while watching entertainment. 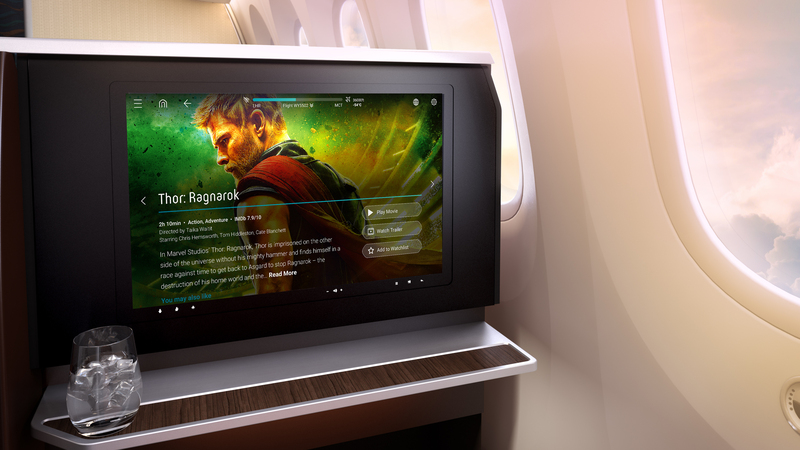 Business class passengers can enjoy extensive range of entrainment options through the airline’s new ‘ARIA’ system with all the latest blockbuster movies, extensive library of TV box-sets, audio and games on a 17-inch personal monitor that provides panoramic imagery. One of the things that is nice about the airline it the local touches that they offer. For example, before departure the crew always serve Omani coffee with beautifully sweet dates. 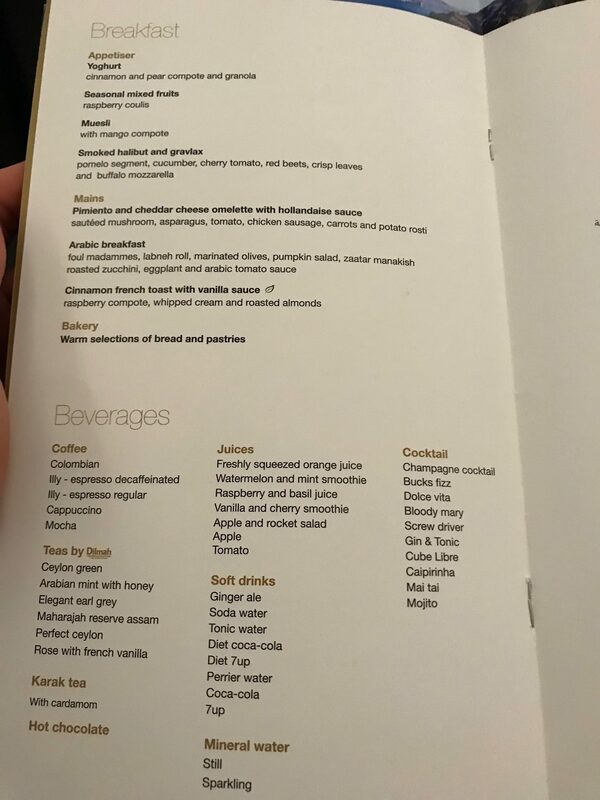 Also, it is one of the few airlines that offers business class passengers the opportunity to drink whatever you want from the drinks menu before take-off. Usually, it’s just Champagne, a cocktail or water on offer on most airlines within business class. Nope, not here – that’s why this airline stands out from others. 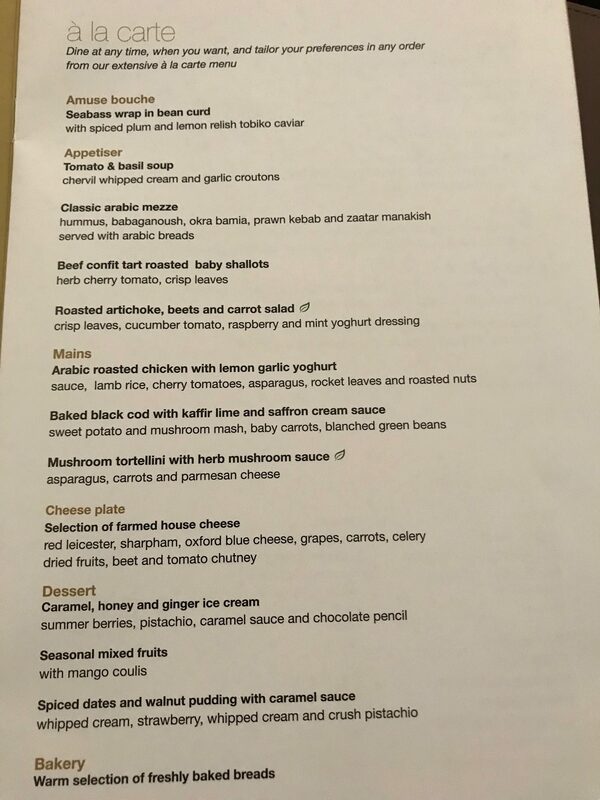 Its onboard hospitality is second to none. 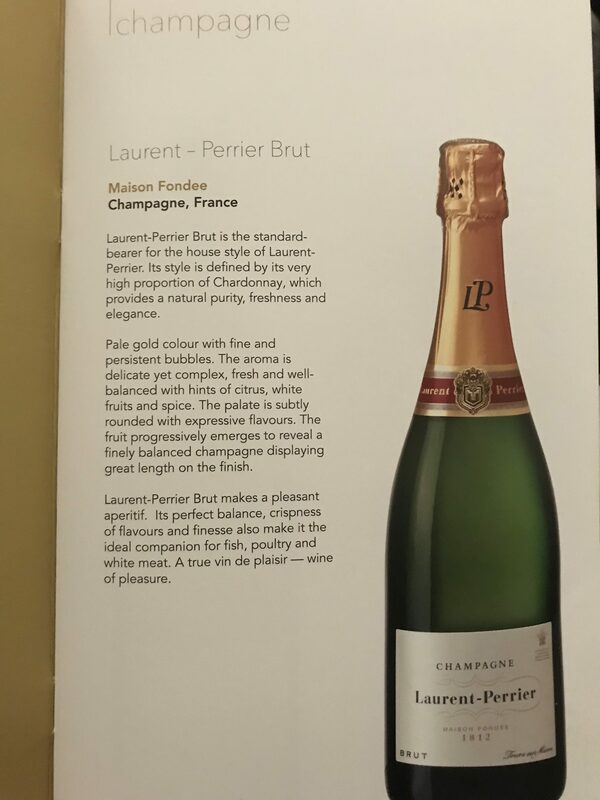 Since the champagne was Laurent Perrier, served in the airline’s signature glasses, we opted for a couple of glasses of the fine stuff before take-off. When the glass was half full, the cabin crew would quickly refill. Each time I put my glass down, it was full again. Just like magic! As expected, there was plenty of hot towels although these seemed thick and luxurious and the water had a light sparkle to it, although this might have been because I was in the holiday mood and I was blown away by just how incredible the onboard service was and how hospitable the cabin crew were. Did I mention that plane was brand-spanking new? 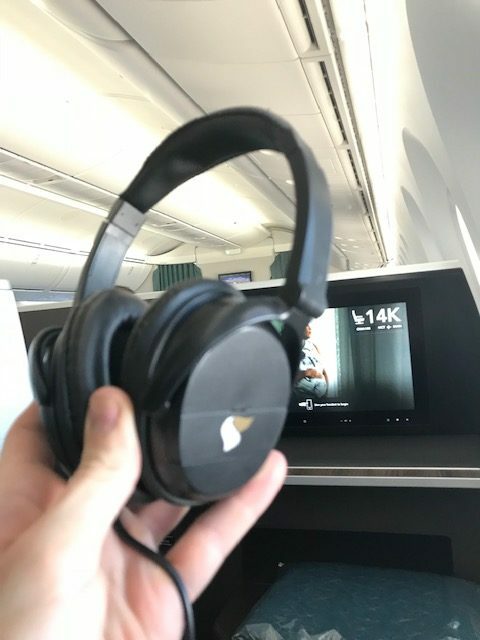 Since our outbound flight was during the night – lasting 7.5 hours – the delightfully helpful and friendly cabin crew came around with an amenities kit and inflight sleep-wear. The beautiful leather amenity kits are made by Amouge, which is a luxury Omani brand. 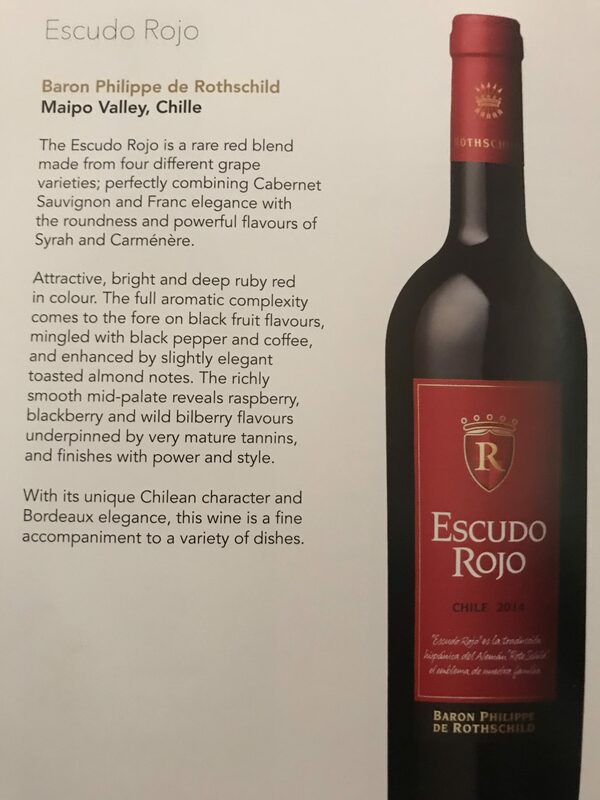 In the UK it’s only available in the department store like Harrods in London. The contents within it includes a facial moisturiser, body balm, eye cream, lip balm – all of which smell divine – an eye mask, toothpaste, toothbrush and socks. 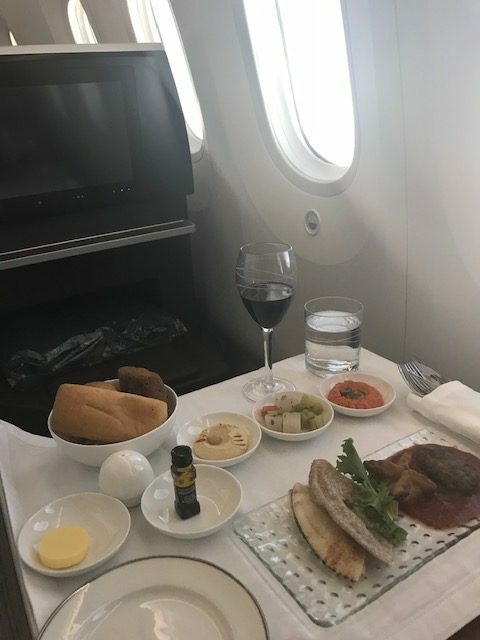 Cabin crew also handed out cosy fleece pyjamas and slippers as part of their range of in flight sleep-wear as well as the food and wine menu available throughout the duration of the flight. Luxurious quilted duvets and high percale count cotton pillows provided additional comfort while seated. 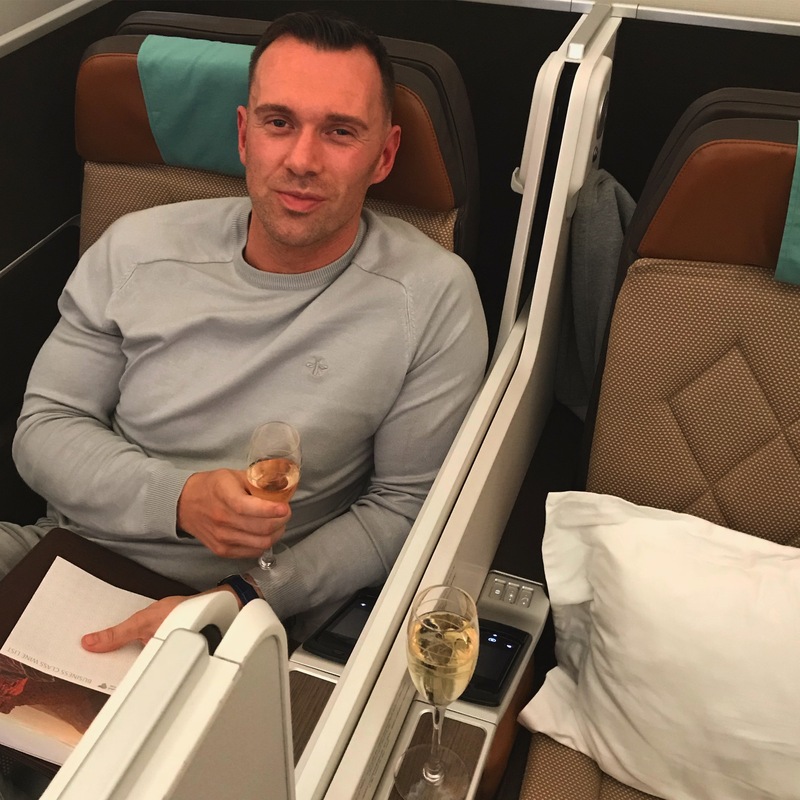 The lavatories at the rear of the business class cabin are much bigger than those at the very front of the plane. Take note if you are tall and need to use the space for getting changed into your luxurious sleepwear. 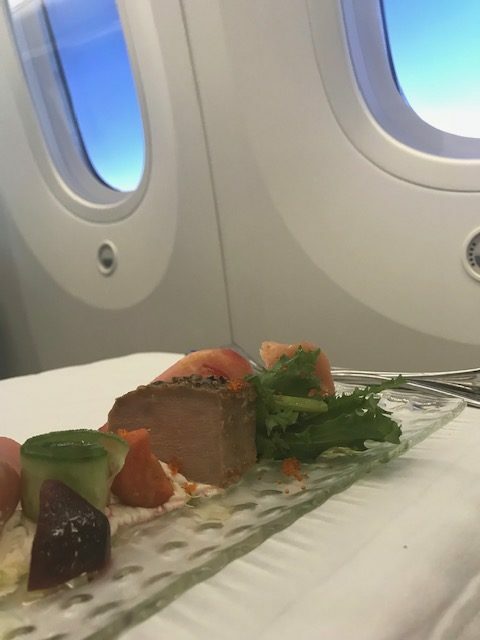 As you would expect with any business class service, the meals are served on beautiful china with gold rimmed plates and bowls and silver service on white linen clothes, all neatly laid out by cabin crew. For my appetiser, I went with the traditional Arabic Mezze, which consisted of a mix of hot and cold dishes with pitta bread on the side. For the main, I had baked cod and tuna belly. The fish tasted just as fresh. The meat was flakey and moist. I asked if a small salad was possible as a side, which wasn’t on the menu and so they brought me another starter size salad to accompany my main. For desert, I had a sweet tooth and opted for the sticky ginger and date pudding. It was just like sticky toffee pudding and reminded me of my traditional home comforts in winter. Heavenly-sweet and delicious! 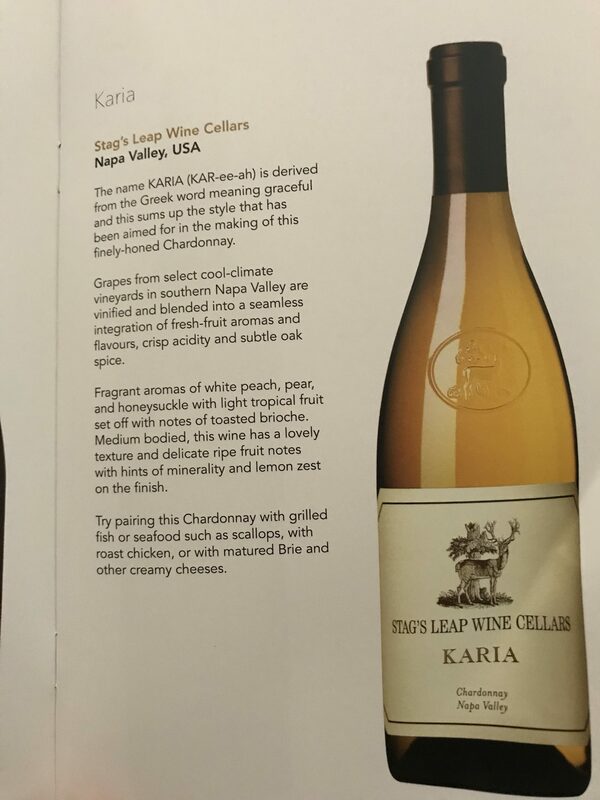 I also ordered a cheese plate to compliment my lengthy ‘wine-flight’. 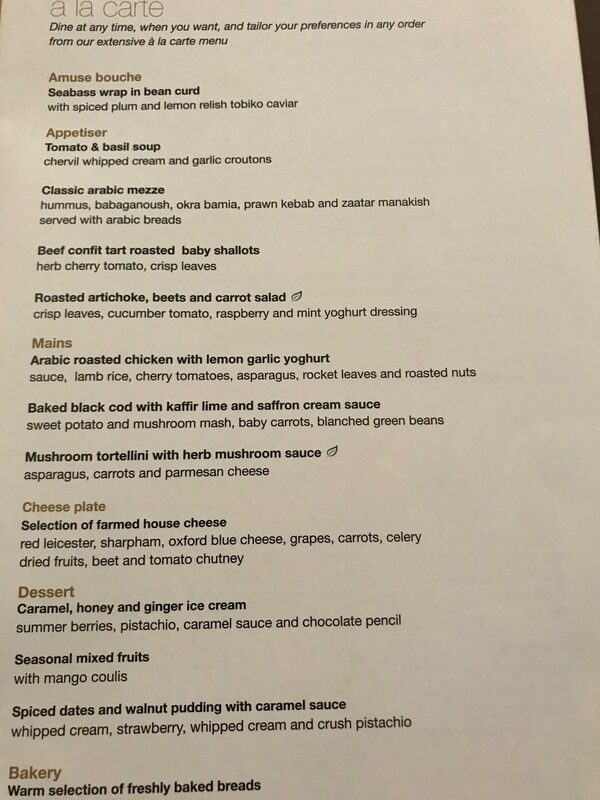 The cheese selection was superb. 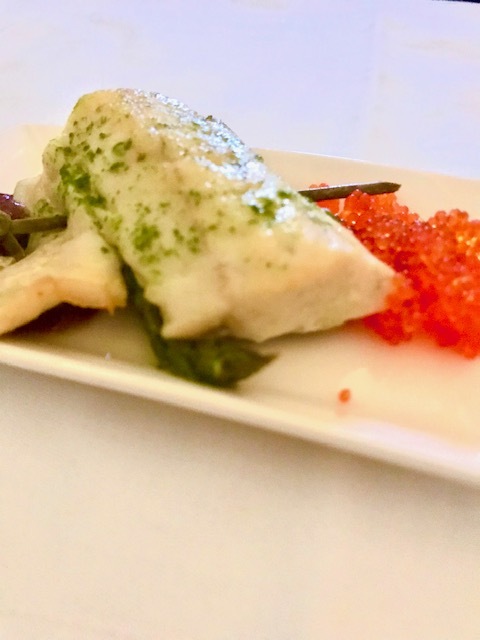 Just as good as what you would get in a Parisian bistro. 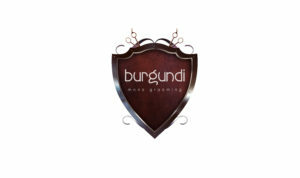 The wine menu is equally as impressive with a range of wines from around the world. I tried every single one of them. 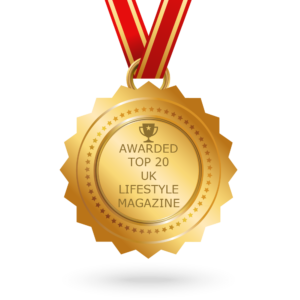 All in the name of love of our readers of course! 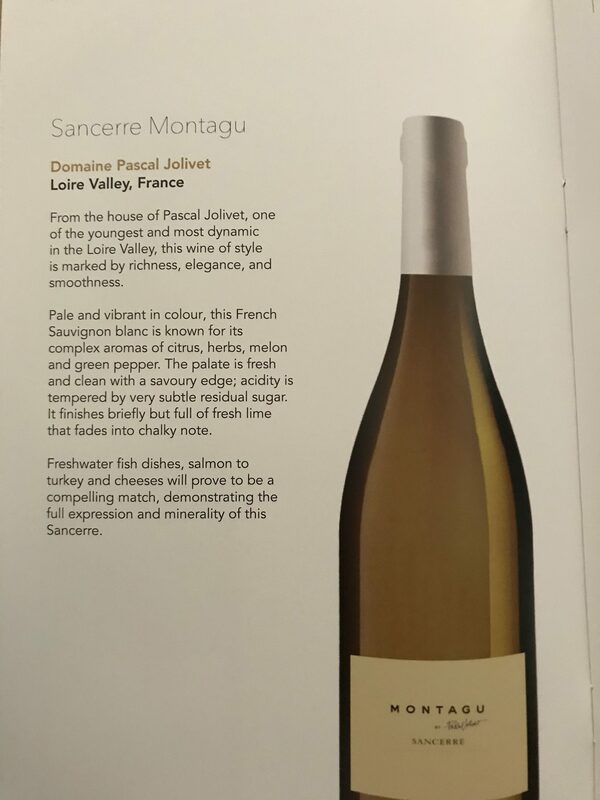 For the appetiser I paired a 2016 Domaine Pascal Jolivet Sancerre Mantagu white wine, for the main I ordered a 2012 Chateau Laroque Saint Emilion Grand Cru Bordeaux and finished with dessert wine 2006 Chateau Guiraud 1st Grand Cru. 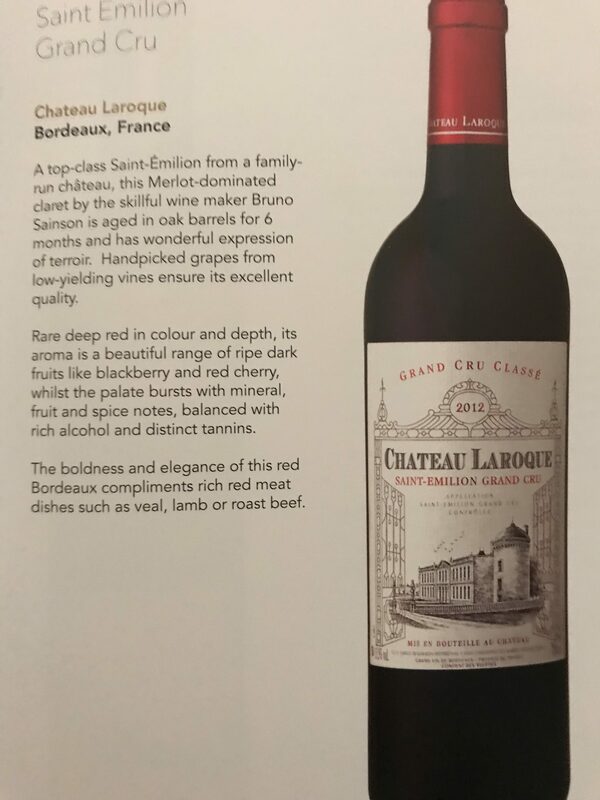 My favourite was favourite was Emilion Grand Cru from Bordeaux. I had several glasses for medicinal purposes to help me sleep. Ahem. The cabin crew offered to make up my bed for the rest of the flight. The mood lighted adjusted as most of the passengers became sleepy after the dinner service. 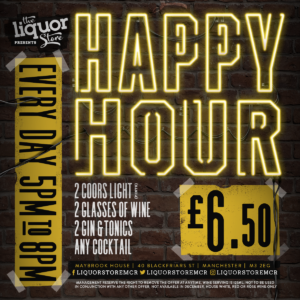 One thing to note about the range of full spectrum mood lighting setting is that it’s designed for boarding, relaxing, dining and resting. 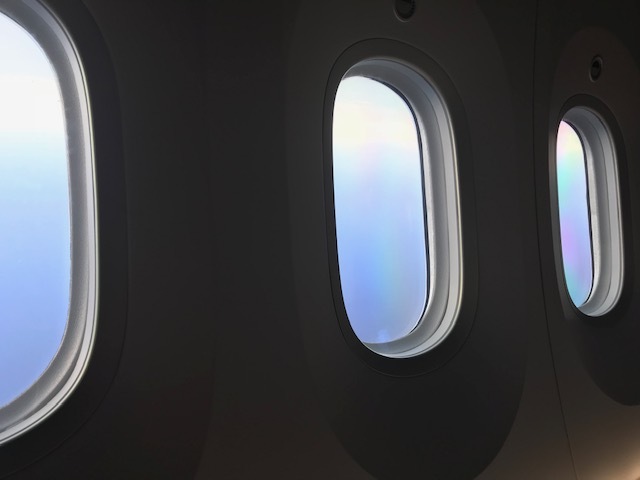 This is one of the unique features of a Dreamliner, along with largest windows in the sky so that each guest has a majestic view when flying. With just a touch of button, you can adjust the levels through electrochromatic window shades from transparent to dark. With enhanced air quality and lower cabin pressure that helps you to feel more comfortable when flying and better adjusted and alert upon arrival at your destination. This was well and truly proven as I slept for a solid four hours and missed breakfast service. 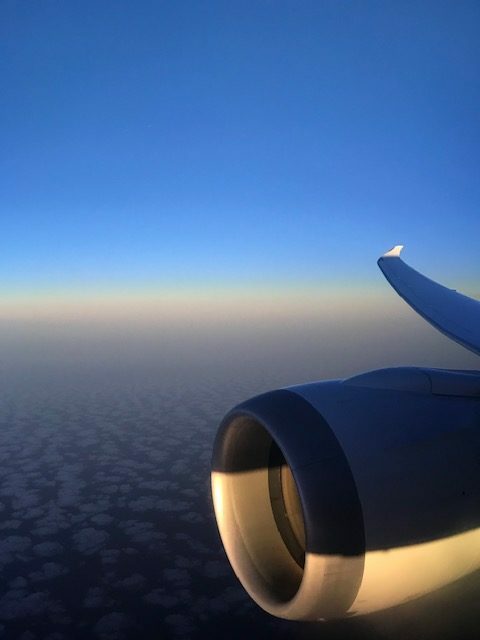 I was in such a deep sleep that I only woke up when I heard the captain informing us that we had to quickly descend as we were arriving much earlier than scheduled -some 30 minutes earlier than planned. In no time, we were descending into Muscat as if we were on a magic carpet. We quickly disembarked and arrived at what looks like a beautiful shiny new airport. 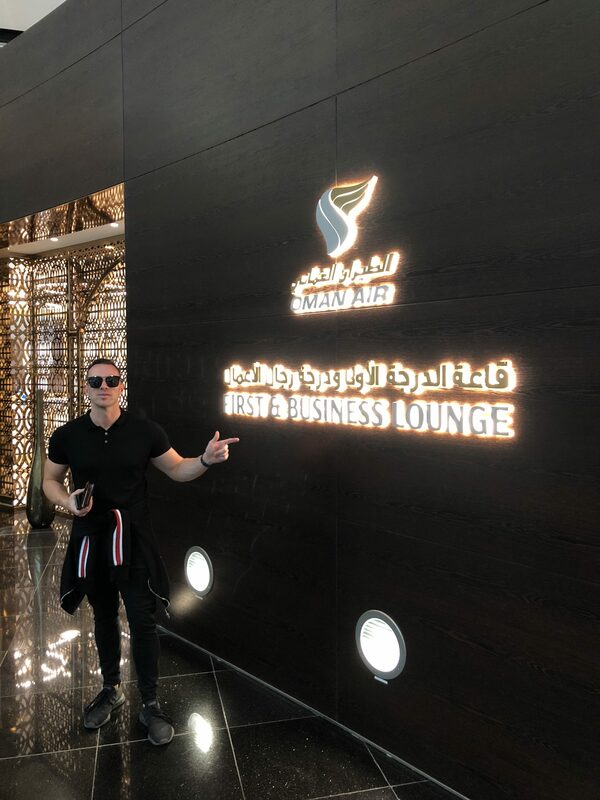 Once through passport control and immigration, we headed to Oman Air arrival business class lounge to freshen up while waiting for our driver with the excitement of seeing more this fabulous country and experiencing its wonderfully warm culture. 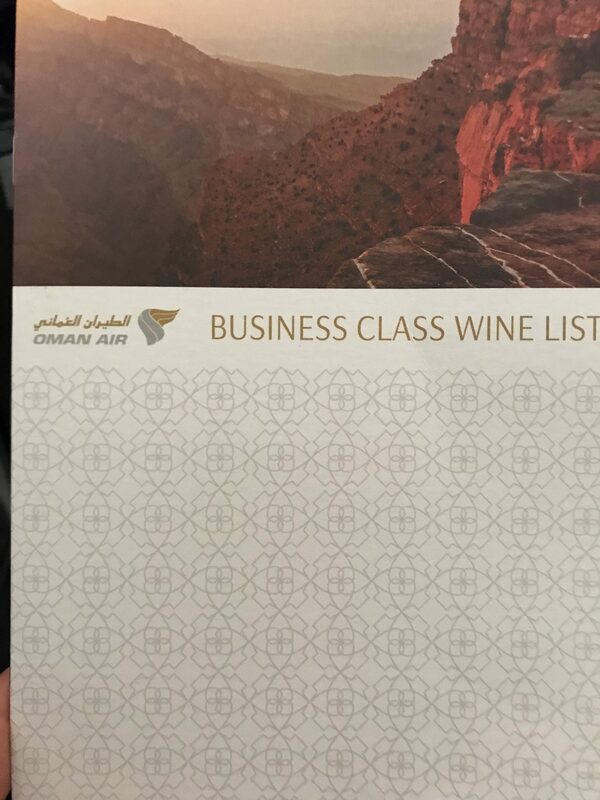 My overall verdict is that Oman Air offers one of the World’s best business class Apex suite seats with direct aisle access. 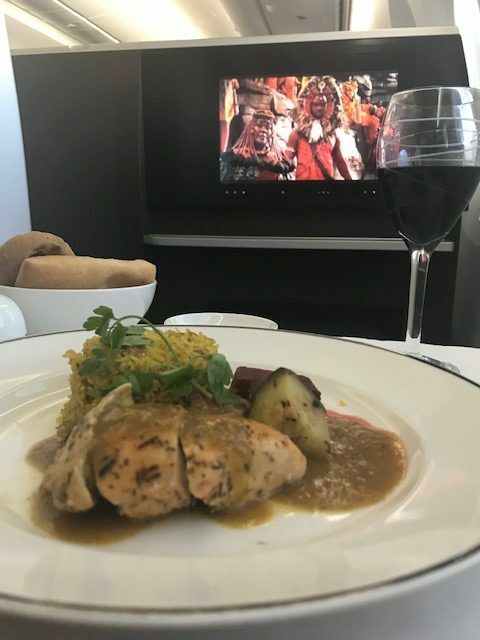 Service wise, the cabin crew were very strong throughout the flight and represented the true hospitality of Omani culture. 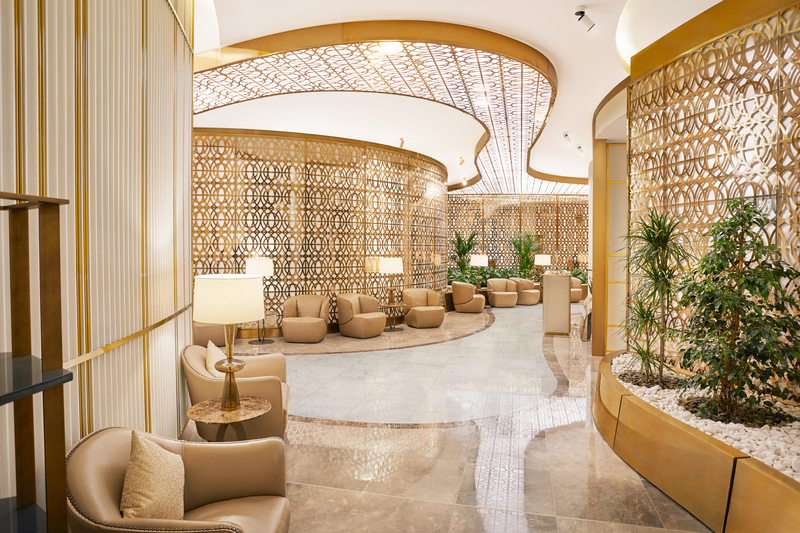 We stayed at the Sundus Rotana in Muscat, prices per night start from £98. 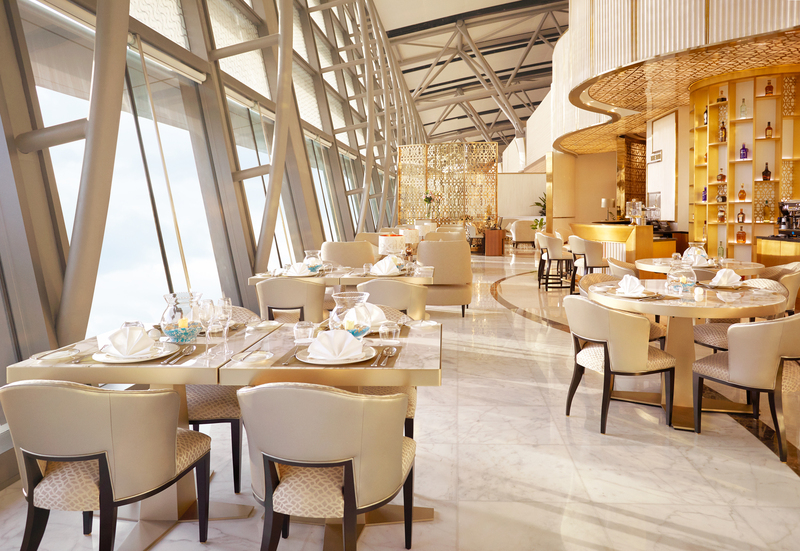 Read our review on the hotel and book here.